After first automatic reboot the install stopped and had to manually restart again. Checking the box the check I placed in the box was gone. Why did the checkmark vanish? Installing updates for Windows7 x64 bit. Where did it stop? Could you provide a screenshot of where wsusou stopped? 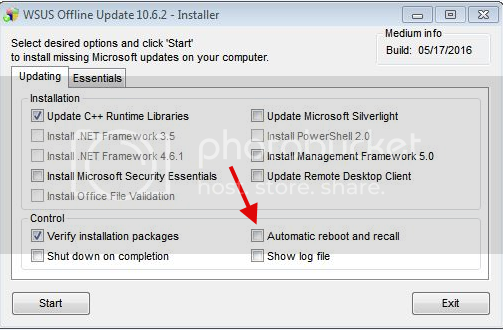 The settings of UpdateInstaller always reset themselves, but if you select "autoreboot & recall" they will be saved for this session until the auto-reboot-loop finishes. I will do a system restore, and start again. If it does it again I will take a screen shot, at that point. Thanks for a brilliant program. This is a screen shot of final options before clicking the "Start Button" to install. After the first auto reboot, the install stopped. Looking I see the check is now missing for "Auto Reboot"
I will have to manually start to continue install of updates. I meant the cmd-windows, which is popping up after you clicked "Start". Where does it hang there? Other Techies who I communicate with are having exactly the same issue. I will start again and get the CMD screen shot. Thanks for your help, Aker. 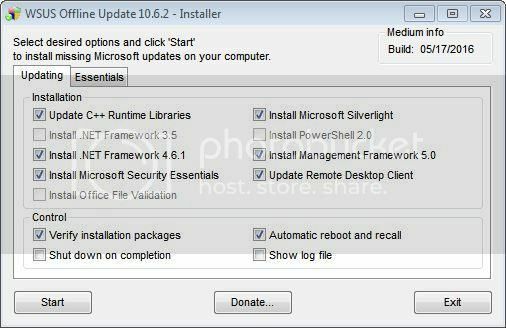 Worked out the best way to install updates plus extra updates in final options box, with minimal reboots. What exactly fixed your problem? Just asking to find possible bugs or help others with the same problem. In the first image I posted it shows all the boxes I checked. However, when I did this in testing, the install stopped at the first reboot. I had to restart the install each time. When I ran a second test using what I've shown in the second box, it rebooted automatically every time, and installed nearly 150 updates. what would be useful if you told us the environment. Is it in a domain? Are you running WOU from a network share? Do you have full permissions to alter WOU on said share? I set my updateinstaller.ini as read only to set defaults and then I can select certain ones. when I reload WOU all the defaults are selected.